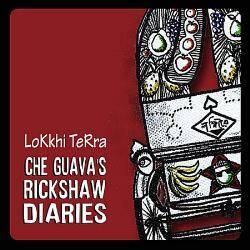 Lokkhi Terra found their way onto my radar only in recent months, when their curiously titled album Che Guava’s Rickshaw Diaries quickly found its way onto the SoundRoots chart and into the hearts of myself and other listeners. The United States likes to use the term "melting pot," but the heat of compressed cultures in dense London seems to bring out some of the best music around. Lokkhi Terra have been around since 2006, and feature musicians who have played with a literal who's who of global music (as well as a number of pop bands). Their music is hard to describe, but very easy to enjoy -- just have a listen to the Indian-meets-ska tune "Tumi Eshechile Porshu." Google Translate has no more idea about the meaning of the song's title than do I. But I'm willing to nod my head agreeably at the uncomprehended language and enjoy the ride. The band describes their sound as “a musical journey taking you from the melas of Bangladesh to the streets of Habana, via some districts in Lagos on to a bustling club in London.” The Cuban influence is evident on "Bhromor Koiyo." Here's hoping the band will tour in support of the new album; I'd love to put faces to these amazing songs, which transport the listener to a place may not exist, but has its own polynational soundtrack nonetheless.